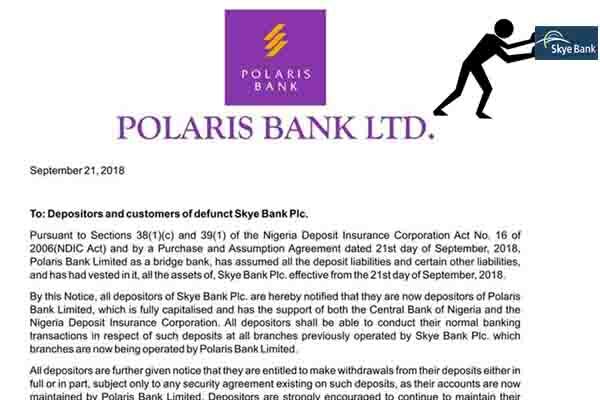 Effective from Monday, September 24, all operational branches of Skye Bank Plc would now be identified as Polaris Bank Limited (a bridge bank), as the latest takeover of distressed financial institution in the country. The development, which has been under the direct intervention of the Central Bank of Nigeria (CBN), would still be managed by the Asset Management Corporation of Nigeria (AMCON). In the takeover, a fresh N786 billion soft and long-term financing at single digit interest rate has been injected to keep the rejuvenated operations ongoing, while the initial N350 billion injected by the apex bank would be withdrawn. At a joint press briefing by the apex bank and Nigerian Deposit Insurance Corporation (NDIC), the regulators were unanimous in affirming the continued operations of customers’ accounts under Polaris Bank. CBN governor, Mr. Godwin Emefiele, said the result of examinations and forensic audit of the bank revealed that Skye Bank requires urgent recapitalization and can no longer continue to live on borrowed times with indefinite liquidity support from the CBN, but the shareholders of the bank have been unable to recapitalize it. On July 4, 2016, CBN took a regulatory action on Skye Bank, leading to the resignation of its chairman, all non-executive directors on the Board, as well as the managing director, deputy managing director, and the two longest-serving executive directors on the management team. Emefiele said the focus of action then was to save depositors’ funds and ensure the bank continued as a going concern, being a systemically important bank. It was also to stem the imminent job losses to staff if a liquidation option had been adopted then, adding that the objectives have been fully achieved now and the bank has been able to meet customer obligations, having curtailed the liquidity hemorrhage and restored depositor confidence. 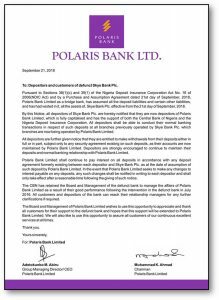 “As a responsible and responsive regulator and in consultation with NDIC, we have decided to establish a bridge bank- Polaris Bank- to assume the assets and liabilities of Skye Bank. “The strategy is for AMCON to capitalize the bridge bank and begin the process of sourcing investors to buy out AMCON; hence the license of the Skye Bank is hereby revoked. “We wish to assure all depositors that under this arrangement, their deposits shall remain safe and that normal banking services shall continue in the new bank on Monday, September 24, 2018 to enable customers to transact their businesses seamlessly. “Futhermore, all customers of Skye Bank shall be automatic customers of the new bank and their accounts and records duly purchased by Polaris Bank,” he said. The apex bank chief said that given the good performance of the board and management, CBN would retain them, as well as all employees of the defunct Skye Bank under a new contract, unless any employee decides to opt out. “We wish to assure the general public that the Nigerian banking industry remains safe and resilient and that the CBN will continue to live up to its responsibilities of promoting stability in the banking and financial system,” he added. While responding to questions, he said even if AMCON could not find new investors for the bank before its tenure in 2024, the bank would continue to be under CBN’s management, CBN being the major stakeholder in AMCON. Two years after Skye Bank being under “life support” from the liquidity provisions of the apex, it was handed out to investors, just like the former CBN governor, Mallam Sanusi Lamido Sanusi, did in efforts to save the bank from collapse in 2010. Three banks- Mainstreet Bank (Afribank), Enterprise Bank (Spring Bank) and Keystone Bank (Bank PHB)- were casualties of corporate governance failures, but were revived and sold to new investors years after, with Skye Bank acquiring Mainstreet Bank. Knowledge is power only when it is shared.